I went back to Fallout 3 recently, to finish the final set of achievements I hadn’t yet mopped up, including the ones for reaching certain milestones with neutral karma. I hit the neutral karma ending, and it reminded me of something that bothered me about the game. A little context here. 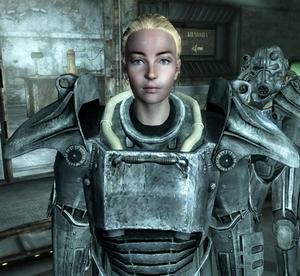 Before any of the downloadable content was released, the ending of Fallout 3 had the Lone Wanderer (the player) and Sara Lyons, a member of the Brotherhood of Steel, fight their way to the control roam of Project Purity. After defeating the Enclave, they find that the control room is awash with radiation, somehow damaged in the fighting or sabotaged by the Enclave. The Project will be destroyed if the systems aren’t reset, and your father’s dream to bring pure, clean water to the Wasteland will be lost. Either you, or Sara, need to go into the room and enter the code to reset the system. Whomever goes in will be killed by the radiation. At this point, the good option is to sacrifice yourself to save your father’s work. The neutral ending is to let Sara do it. The evil option is to taint the project with the FEV virus, but we are just going to look at the good and neutral choices here. This is completely fair. You let Sara knowingly walk to her death, when you couldn’t, to save your parent’s life work. Compounding this is the control room is where your father died himself earlier in the game, protecting the secrets of the project and the Lone Wanderer from the Enclave. If you allow Sara to do this, you did not learn your father’s lesson of sacrifice. The problem I have arises if you complete the game after the Broken Steel Downloadable Content has been installed. The basic assault on Project Purity remains very similar, except if you have a companion, they can come with you. When it comes time to reset the Project, you can send your companion in with the code. If you do this, the voiceover above still plays with the final credits, except instead of Sara’s picture, it shows the companion you sent into the radiation instead. The problem is that once your companion shows up, you are not necessarily sacrificing anything. 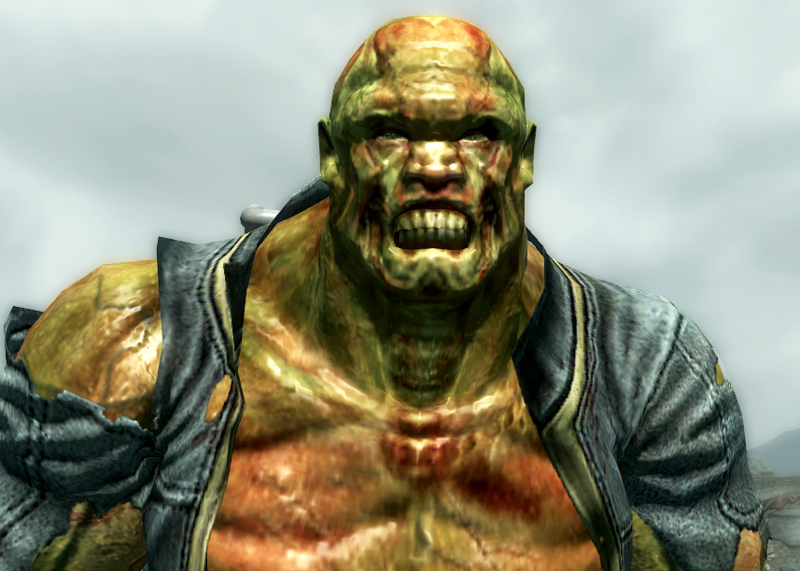 Fawkes, one of you possibly followers, is a Super Mutant. Both Sara and the Lone Wanderer are human, and the high level of radiation will kill them in the Control Room. When you first meet Fawkes, he convinces you to let him out of a cell, in exchange for him retrieving an item from a high radiation area. In the conversation where you ask him to go restart the project, he agrees he is the best choice, because of his immunity to radiation. After the credits finish, Broken Steel places you in the hospital in the Brotherhood of Steel Citidal, and Fawkes is waiting, completely fine. In this instance, there was no sacrifice. No matter who goes into the control room, both Sara and the Lone Wanderer are knocked out, and both are in comas for two weeks. Fawkes is fine, thanks to his immunity to radiation. Then again, he’s not the only companion immune to radiation. Today, we build robots to go into situations too dangerous for human beings. This is one of the expressed reasons the military builds robots, and even if artificial intelligences deserve special consideration, sending in a robot to an irradiated zone is not a sacrifice. It’s a function of the robot, and it is the correct solution to a problem. Sergeant RL-3 should be a perfectly acceptable option. Charon is a ghoul, a human who has been irrevocably altered by high doses of radiation. 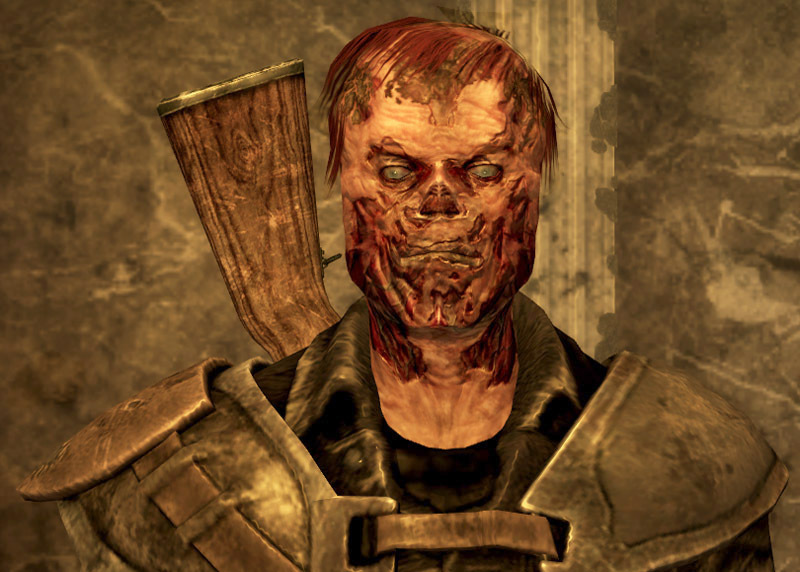 In Fallout mythology, in some rare cases, instead of dying, an irradiated person turns into a ghoul. These beings aren’t just immune to radation, it actively heals them. Charon can also be sent into Project Purity. It does take some insistence on the Lone Wanderer’s part, but Charon can head into a room which is, quite literally, restoring him, and reset the project. The lesson the Lone Wanderer was supposed to learn from James about sacrifice is not the one this ending implies. James makes two big sacrifices in Fallout 3. The first is after his wife dies and the Lone Wanderer is born. He gives up Project Purity, his life’s work, for the safety of his child, moving into Vault 101. While he continues to research the Project using Vaultec resources, he no longer actively pursues it. Once his child is of age, and safe within the Vault, then James leaves to once again work on the Project. James second sacrifice comes when he is locked in the control room of Project Purity with the Enclave. In order to save the Project, and his child, he floods the control room with radiation, killing the Enclave present. 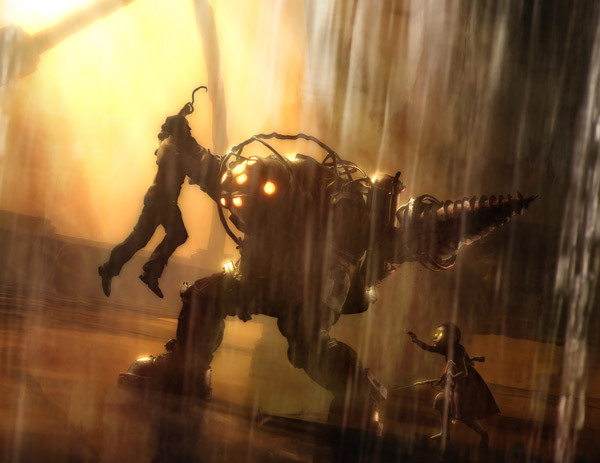 He had no other way to fight the Enclave, to protect his child or his work. Sacrifice was actually required here. But James was very pragmatic throughout the whole game. He took the hard or the dangerous path when there was no other choice. James was never looking to die. He wanted to complete good works, and he understood it required the cooperation of others. He had help from Doctor Li, and the Brotherhood of Steel. The problem here is the very nature of DLC. When Broken Steel was added on, the ending wasn’t changed enough. It didn’t account for the fact that the companions sent in could save the day without sacrifice. This was either an oversight, in that the voiceover was not updated, or a thematic mistake. If the point of the game is to demonstrate sacrifice, then all other options need to be exhausted. It is a sacrifice to throw yourself on a live grenade to save the people around you. If you pulled the pin in the first place, it’s not really a sacrifice as much as a suicide. While other options exist, dying to achieve this end is unreasonable. It is not the lesson or the example provided by James. Games are a unique medium in the fact that they continue to change. Movies, plays, paintings, books, and TV series do not go back and add on new content in the same way. In some cases, there are special editions, directors cuts, and rereleases which alter the original work, but it is not expected that every piece of work in these fields will see later updates. DLC is expected for games, and it can make it more difficult to hold a theme or consistent narrative. This was definitely a misstep in Fallout 3. It should be obvious at this point that I love this game. It has some of the best storytelling in the current generation of gaming. It is the strength of the rest of the work that makes this moment so glaring to me. When creating additional content, game designers need to be incredibly careful to match the message with what came before. To chastise a good karma character, who has made all the right choses throughout the game, with censure for sending Fawkes into the control room, is to belittle the choices that player made throughout the game. The chose to send in a radiation immune companion should be applauded. Given the option, I’m certain James would have done the same thing, and the Lone Wanderer should have this considered a legitimate choice. The ending voiceover should not scold them for it. It needed to be changed, because you are no longer asking Sara to die for your in game avatar. This needs to be recognized, and it was a failure in the new options. Either companions should not have been allowed, or the message needed updated. I apologize for the delay in this current series of articles. I have been dealing with a serious family emergency, and hope to be back on schedule next week, but due to a limited buffer, I was unable to provide content in this difficult time. I apologize for anyone who is waiting for the next article. Last time, we looked at the effect Rapture has on medicine. This time, we’ll look how the city changes what constitutes crime. Arriving in Neptune’s Bounty, Jack soon finds a body crucified on the wall before him. Written over the body is the word “Smuggler”. This is odd for a few reasons. First of all, the punishment does not fit the crime very well. A smuggler is not the most vicious type of criminal, and the term doesn’t really carry a connotation of violent or dangerous. A smuggler implies that this is someone who moves contraband, but likely to avoid tariffs and embargoes. While Rapture has become a violent and terrible place, being killed in such a grotesque manner for smuggling seems odd. This is more disturbing when one considers the ethical ethos of Rapture. The city is an objectivist paradise, where the government has no right to take a tax cut from businesses. Andrew Ryan rages against the parasite, taking his cut from the work of honest men, on banners, videos, and diaries throughout the game. For someone to smuggle, they would have to be moving goods past the ruling body of the city, but this would mean that they were avoiding Ryan. This leaves the question as to what they were smuggling. Audio dairies from Sullivan, the security chief for Rapture, reveal that most of the smugglers are poets, artists and tennis players. Again, these aren’t hardened criminals, certainly not the type one would need to stop with a grizzly execution. While it does turn out that Fontaine, Andrew Ryan’s greatest nemesis in rapture, is behind these smugglers, the smugglers themselves do not seem that dangerous. Further examination, of the crates and crime scenes in the area, reveal the contraband they have to sneak past Ryan. They are smuggling bibles. The area begins to imply that the faithful of Rapture are much like the earliest Christians, hiding in caves to worship quietly in the Roman Empire, afraid of the powers that be. Andrew Ryan specifically built Rapture to be free of religion, viewing the Church as a parasite as much of the government. He abhorred their moral censure and felt it had no place in his world, and by doing so, morally censured them. He viewed them as a threat to his project. He was right, in that Fontaine was using them to build his own power. By befriending the oppressed, the downtrodden who failed to find a better life in Andrew Ryan’s great experiment, he built an army. He used those Ryan tried to stamp out to fight against him. He built the resources and the public support. From Jack’s perspective, it all starts with a single crucified man at the entrance to the area. The parallels create a great deal of sympathy for those who simply wanted to believe quietly, and who became pawns of bigger forces, who used them as symbols of evil, and as martyrs to drive their wars, which were not related to the beliefs of those who died. 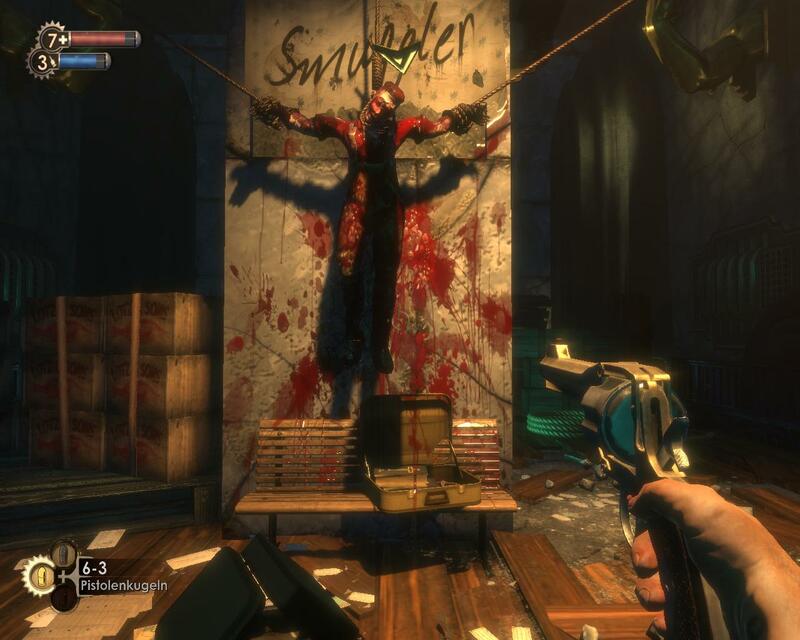 Crime and religion are the same thing in Rapture, as religion is corrupted by the elite to their own ends. 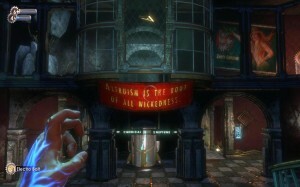 Bioshock provides an environment built around an objectivist society. The game explores how the high, well-organized ideas, presented so well by Andrew Ryan, fall apart. One of Ryan’s main concepts is that there should be no moral oversight on the works of great men. This starts to tear apart aspects of life that are generally considered highly ethical. Early in the game, the Medical Pavilion shows the player how far Rapture, Ryan’s city, has delved into depravity. As you explore the area, you find three dental clinics, an insurance agency, a crematorium, and a cosmetic surgeons. No where is there a general practitioner’s, an emergency room, or the type of clinic you would expect to see. There is not a lot of effort made to heal people in Rapture. First Aid stations exist throughout the city, but these can be corrupted on an individual level. The player can hack the stations so that if anyone else tries to use them, they are poisoned, adding to the theme of corrupted medicine. This explains the lack of any sort of service for those in need of dire treatment. Helping someone, just for the sake of it, without them requesting it or offering compensation, is an act of evil by the morality present in Rapture. It would be wrong, in this place, to just help someone. A diary from Ryan states “People who want free healthcare or food are perverts in search of victims.” Traditional medicine, which contains an element of assisting those who need it for its own sake, no longer exists. Part of this is due to ADAM, the substance developed to allow genetic modification throughout the city. ADAM replaces existing cells in a host with unstable stem cells. This can be used to grant some of the psychic powers throughout the game, and there is also some indication that it contains healing properties. The Little Sisters are nearly invulnerable to harm based on the ADAM injected into them, with the exception of the harvesting process, for example. Medicine was not needed in the same way, due to ADAM. 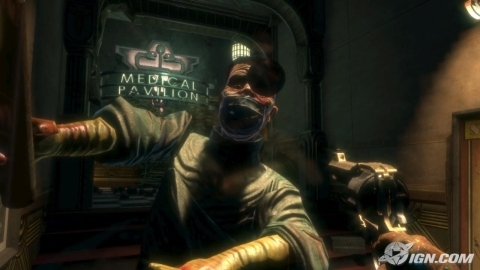 In spite of the side effects, making splicers who used the substance mentally unstable and cosmetically deteriorating them, people chose this over traditional healthcare throughout the city. It should be noted that the main researchers behind ADAM were a Nazi collaborator and an opium dealer, providing insight into the ethics involved in even the most upstanding uses of ADAM. Doctor Steinman is the driving force behind what was left of the Medical Pavillion. He felt that on the surface, he was held back by morality. He became obsessed with human ascetics, and is the main reason the majority of the Pavillion the player explores are for more cosmetic procedures. With ADAM’s ability to reshape people in his hands, Steinman’s obsession with beauty becomes extreme. He has the ability to change people entirely, and begins to experiment with non human appearances. This obsession has literally driven Steinman mad, and left its dark mark throughout the area. He has written on the wall in blood “Adam denies us any excuse for not being beautiful”. He also writes “Aesthetics are a moral imperative.” This man is in charge of the medical section of the city, but he has no concern for healing. His only concern is curing what he perceives as imperfections. An audio journal in his surgery theatre records his work on one of his patients, where he decides that while she came in for a nose job, he feels a face lift is also necessary. His nurse is confused, and tries to stop Steinman, but the doctor continues to work, in spite of her screaming protests. Steinman has lost his way as a doctor. He has also written on the walls, in blood “Above all, do no harm.” This is perhaps the most twisted perversion of the Hippocratic Oath, which all doctors swear. He has caused harm to create this message, but to his mind, only a lack of aesthetics is harmful. He cares about nothing but making people fit his version of beauty, which now allows for more than mere symmetry, as he looks at adding extra pieces, or removing them from people, using the power of ADAM. 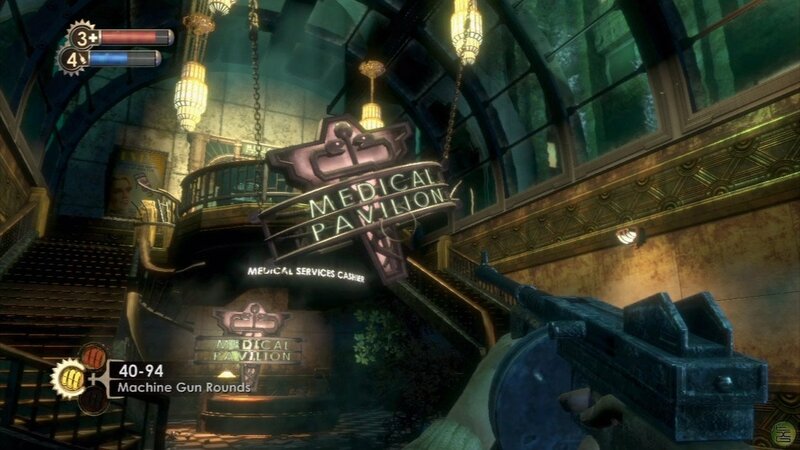 The institution of medicine is completely destroyed in Rapture. Doctors who should be concerned with healing their fellow man are now injuring them under a misguided sense of beauty. Healing is no longer a human endeavour, as it is all done by ADAM and first aid stations that inject it. Medicine has no more place in Rapture. While it is interesting to note how the various factions of the DC Wasteland treat their tech, or how self-aware technology upholds itself morally, the truest test of the idea that technology in Fallout 3 is without an inherent ethical standpoint is how the player interacts with it. The player’s choices represent the moral possibilities the creators of the game offered the human interacting with their technology. 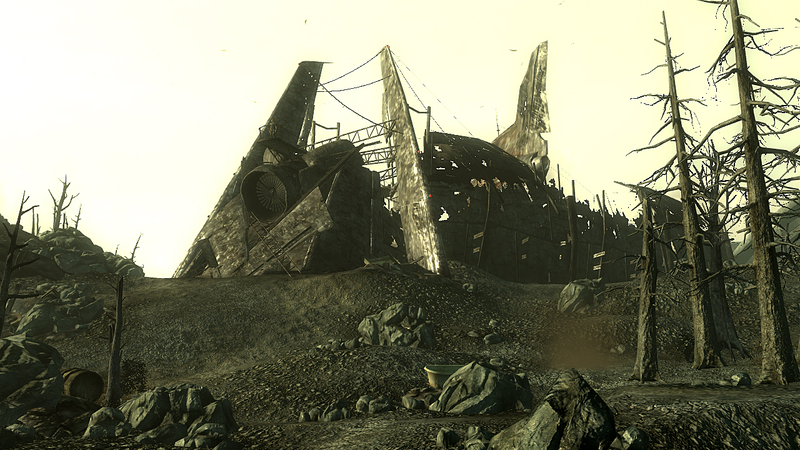 The first location the Lone Wanderer is likely to discover after leaving the vault is the settlement of Megaton. This town is literally built around the bomb. The centre of the settlement is an unexploded nuclear warhead left over from the war in 2077. People began gathering around it, and not only a city, but also The Church of the Atom came from this specific bomb. The player has the neutral option of leaving the bomb alone, and going on with their life. The town will remain as it has always been, and Megaton stands as one of the most important settlements in the Wasteland. The bomb is safe. If the player stands close to it, it does bleed radiation, but it is not hard to avoid the limited radius of this effect. The status quo can be maintained. The player is offered a reward by Lucas Sims, the local sherif, to disarm the bomb. While it is stable and safe, and can be left alone, the town would be even safer if the bomb couldn’t go off. The player is rewarded with some cash, karma, and a place to live in Megaton. The community completely accepts the Lone Wanderer if the bomb is made into an irradiated decoration. Even in the atomic ravaged DC Wasteland, there is someone who wants to use the weapon. 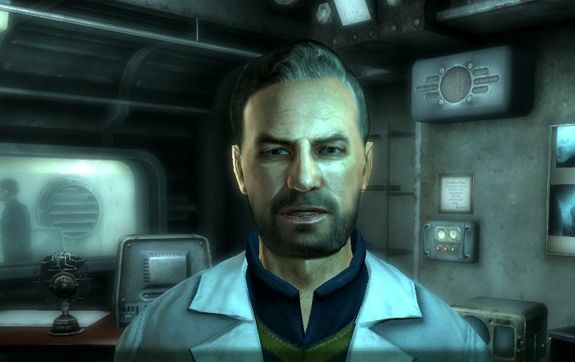 Mr Burke, a representative of Alistair Tenpenny, will offer the Wanderer 500 caps, five times what Lucas offered, to set off the bomb. He can be talked up to 1000 caps. If the player agrees, they are also given a suite in Tenpenny tower. the house in Megaton offered for the good karma solution is a corrugated metal shack. The Tenpenny Tower suite given to the evil character is one of the nicest places to be found in the Capital Wasteland. Destroying the town is one of the most evil actions that a character can take in the game. If you meet James, the Lone Wanderer’s father, after either disarming or setting off the bomb, he will comment on this action. It is the only quest he will comment on, indicating the importance of the quest. The negative karma gained from setting off the bomb is exceedingly difficult for the player to overcome, and will generally set a character permanently down the road to evil if the town is destroyed. It is very easy to apply moral judgements to a nuclear weapon. The real world implications let us know that using a bomb of that magnitude is generally an evil, if not questionable action. 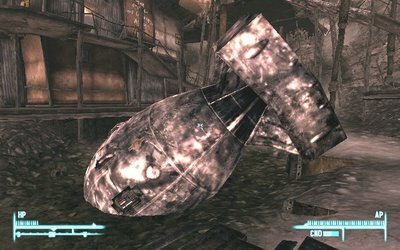 Considering the character will only have the option to set the bomb off for economic gain, there is no question that it is wrong to use the Megaton bomb. Interestingly, even in a postapocalyptic nuclear wasteland, the Megaton bomb is not the most powerful force of destruction. The main quest-line in Fallout 3 involves assisting James in rebuilding Project Purity. This is a water treatment facility which will provide clean water throughout the Wasteland. As always, the player has the neutral choice to ignore project purity. The world is rich and varied enough that the Wanderer can explore the remains of Washington without assisting James. At any point, the Project Purity quest can be abandoned, and there is no push to return to it. The game will allow the player to explore its world and partake in its other quests. Dialogue does not suggest the character needs to work on the Project. There is no counter ticking down, or penalty. In fact, before the DLC was released, completing the Project ended the game, so anyone wishing to see more of the game needed to leave it alone. 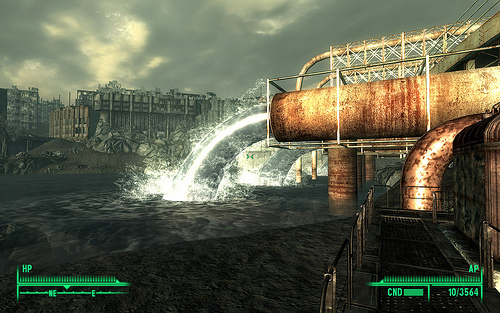 The character can use the water purifier to clean the radiation out of the DC basin. As the DLC reveals, this is not instant, and it takes time. However, clean water is delivered to everyone throughout the wasteland by the Rivet City Security and the Brotherhood of Steel. Slowly, the water is being cleaned, but for the time being it needs to be siphoned off bit by bit and delivered. Eventually, people will no longer need to drink irradiated water. Project Purity is also the most terrible weapon in the game. As the player attempts to escape the Enclave at Raven Rock, President Eden will provide the character with a vial of modified FEV virus. This can be inserted into the purifier. If the player chooses to do so, the virus in the water will attack any non-human or modified cell in anyone who drinks the water. The water will kill ghouls and super-mutants. Eden reveals it will attack any irradiated cells. The wastelanders, who have been exposed to radiation all their lives, through their environment, their food, and their water, will die from drinking it, just more slowly than the ghouls and the super-mutants. The purifier is designed to clean the entire basin, so all the water in the DC Wasteland will be effected. While the Megaton bomb can destroy one of the largest settlements in the area, the purifier will wipe out all life. Eden ensures the player that because the Wanderer was raised in the vault, they will not be effected. However, in the DLC, drinking the tainted water lowers the stats of the Wanderer. Too much exposure to the outside world has made the player’s character susceptible to the FEV. 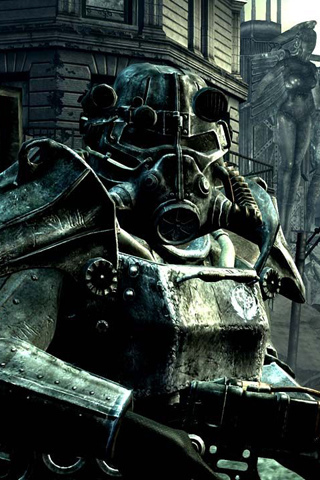 If the player uses it, only the residents of Vault 101, who have never been outside, will survive. The destructive power of Project Purity is the most important part of the statement. All technology can be used for the wrong purposes. Any item can be a force of destruction, and more important than the intended effect of the original builder is how the item is used. The Megaton bomb, a weapon designed to destroy a city, instead had one built around it. Project Purity, designed to save the Wasteland, can be used to eradicate all life. It’s not the technology that is responsible for the good or evil of its use. It waits to be used. It is the people who use it, to amplify their own wants, to increase their own scale, that determine the moral capacity of any human invention. In Fallout 3, technology amplifies human potential, and human choices, but those choices always remain with the individuals in possession of the tech. 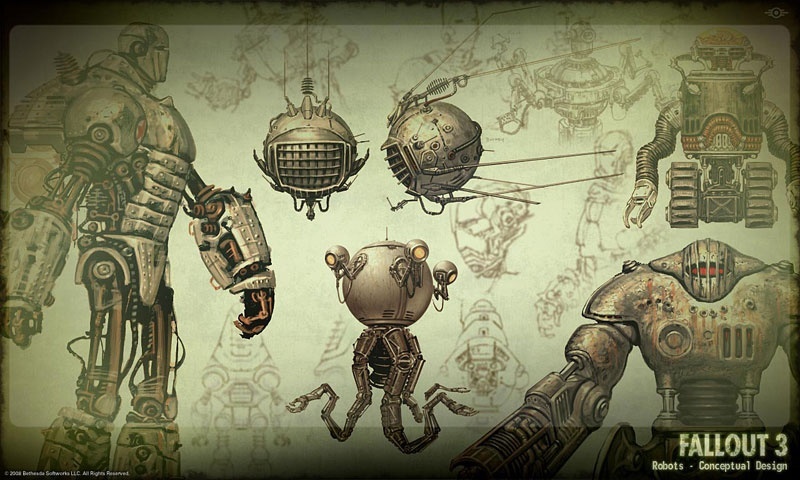 Fallout 3 contains a variety of robots, and like most of the technology in the game, it is more about who uses them. There are Sentry Bots and Protectrons, which continue to patrol the areas they watched before the world fell apart. Robobrains wander the Wasteland aimlessly. 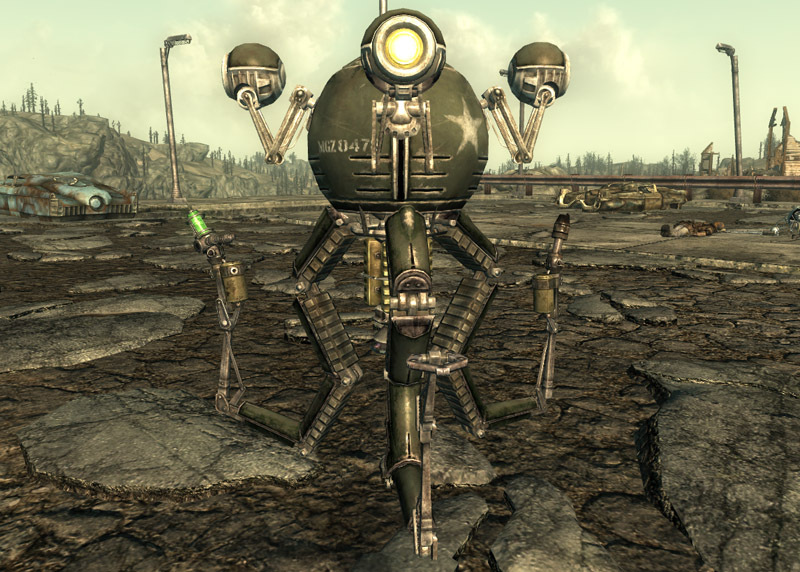 The Enclave’s Eyebots are their most harmless units, which spend most of their time broadcasting the Enclave radio station, and only attack in response to aggression. Numerous points exist where robots can be activated or reprogrammed to assist the player in combat. Robot medics, butlers, and even historians can be found throughout the game. Most are simple enough that they are truly just the tools of those who use them. The three most advanced pieces of robot technology fall into the same moral categories as the three biggest high-tech factions, neutral, evil, or good. To escape, A3-21 came to the Capital Wastelands and found a surgeon skilled enough at facial reconstruction surgery to give him a new look. He wiped his own mind, and started a new life as Harkness, the chief of security in Rivet City. For the sake of this article, he has been considered morally neutral, as far as his life as an android is concerned. He was not willing to put himself at greater risk, assisting other Synths in the Commonwealth, by either helping them escape or stopping their oppressors. He has not done anything wrong, but he does not really strive for the greater good. As Harkness, he risks his life to protect the people of Rivet City, but as an android he was only willing to escape, and be left in peace. 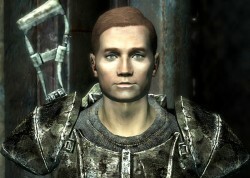 John Henry Eden is the President of the Enclave. It is also an artificial intelligence. The system is extremely patriotic, sending out messages into the Wasteland about restoring America’s future and preserving its history with past times like baseball. The music the computer choses are very patriotic, and it is concerned with things like democratic process. President Eden also directs the Enclave, chosing its targets and setting its priorities. Eden is responsible for the attacks the Enclave stages on non-military targets, such as the Project Purity water purifier, and guides them in the evil they do in the Wasteland. 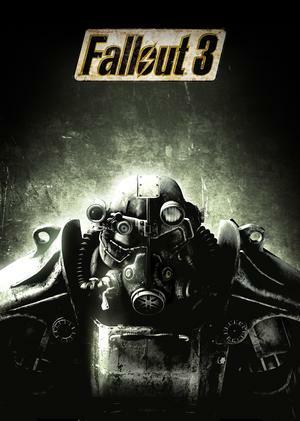 The system reveals its true nature to the player when it wants the wanderer to destroy all irradiated life in the Wasteland using a modified version of the FEV virus. It advocates the death of all impure humans in its efforts to rebuild pre-war society. The President is a number of cautionary tales. It shows the result of too much blind patriotism, and the damage that can be done by people who believe their ends justify any means. It idolizes the past, certain everything was better, and is willing to destroy all progress, however minor it may be, to return to an earlier time. It prefers traditional values over what the people of the Wasteland have come to see as important, and would happily destroy functioning communities such as Underworld, and anyone who had a trace of irradiated flesh, saving pretty much only the vault dwellers. It also shows the danger of blindly following technology. Only Colonel Autumn knows Eden’s true nature. It is implied that the rest of the Enclave would not follow their President if they knew he was an artificial intelligence. This does not change who the members of the Enclave are. Even if Eden is destroyed, the Enclave does continue to follow the same processes, and act in the same manner. These are evil men and women, and they were not made that way by the computer. They would not obey it if they knew it was a machine, but they would still be the Enclave. When Autumn turns on Eden, he is unable to destroy the machine, but manages to move the majority of the Enclave and its forces out from Eden’s control. The man is more powerful than the supercomputer, and the player has the option to destroy the mainframe. Whether or not the player enters the self-destruct code, the President is removed from the game after this point. If it is not destroyed by the player’s action, as soon as Project Purity is retaken, an assault by the Brotherhood destroys the Raven Rock Headquarters which houses John Henry Eden. 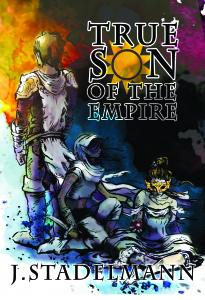 Autumn and his troops remain the antagonist, but they are severely weakened by the loss of the super-computer, and the Brotherhood has them on the run. The fact that the loss of the computer is not the end, and that humanity always makes its own choices are important to the story. Eden does not control the Enclave if they chose to leave, and they can and will exercise this ability. Without them, Eden is defenseless, and the people are the true power of the Enclave, making its choices and determining how it will proceed. 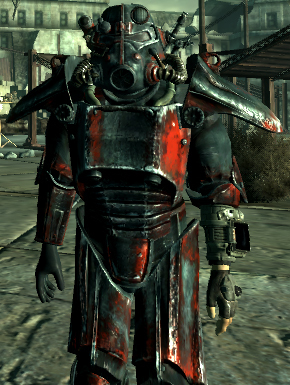 While the Enclave is unaware of their main computerized asset, the entire Brotherhood of Steel is acutely aware of Liberty Prime. This giant pre-war robot never worked before, due to issues with its power, but the Brotherhood and Doctor Li manage to get it up and running, surpassing their predecessors. Liberty Prime is extremely patriotic, and constantly shoots anti-communist propaganda while on missions. It leads Brotherhood strike missions, and is the most powerful destructive force in the Wasteland. In a strange reversal of convention, it is the good force that has the superweapon. 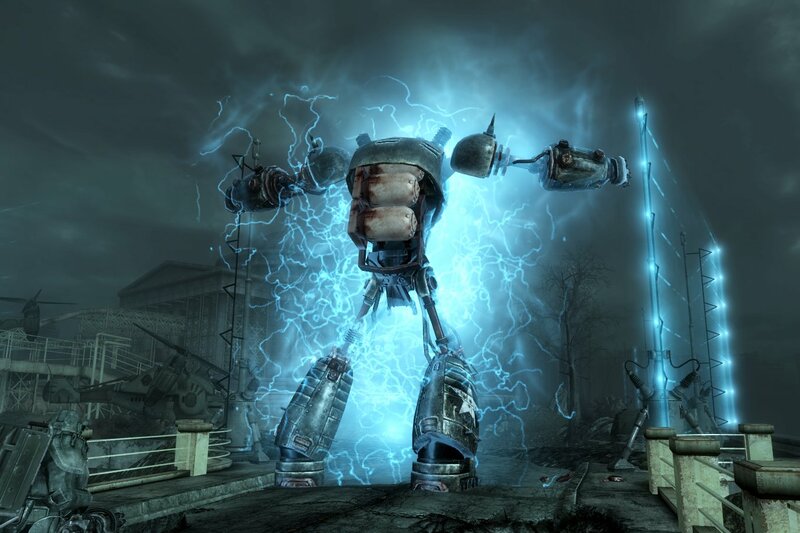 A machine like Liberty Prime is more often seen in the hands of mad scientists and super villains. It is the most powerful destructive weapon in the game, and an unstopable death robot is not usually in the hands of moral men. Meanwhile, the Enclave’s closest equivalent, President Eden, is unable to act directly. It is an intelligence machine, and needs to act through human agents. Eden is a series of ideas, where Liberty Prime espouses ideas, but does not seem overly concerned with enacting them. Consider that while his speech indicates he wants to destroy communism, Liberty Prime is attacking the forces of the self-proclaimed President of the United States. The Brotherhood makes no outward claims at being American, where as the Enclave presents themselves as the President’s army. Liberty Prime never questions why he is attacking the Enclave, and seems to believe that they are the Chinese forces from the war it was built to fight. Both Eden and Prime are as patriotic as they are high-tech. Once again, this is intended. Just like technology is merely a tool of those who use it, patriotism is treated in the same way. Liberty Prime’s targeting parameters may have been reprogrammed to recognize the Enclave as the Chinese, but his patriotism is left intact. This value inspires Eden and drives Prime. Like technology, it can be used for good or evil. In practice, people decide how these things will be used. In the end, war never changes. In the final article in this series, we will look at water purifiers and nuclear weapons, and how they represent the players options in morality for this game. Due to illness, I have been unable to meet the last two updates. Everything will be back on track for next week. I apologize for the delay. Science fiction explores the effects that advancement, both theoretical and technological, have on society. In the majority of cases, the outlooks can be divided into those stories which present the technology as generally beneficial, improving human capacity, and those which show us the dangers of overstepping our bounds. Stories like Dr. Jekyll and Mr Hyde or Frankenstein long ago started a tradition where a great deal of the genre was about th dangers of science. Works like Star Trek explored the idea that when we were freed of our most basic needs, we could move forward as a species to our greatest potential. Even video games have this moral dichotomy. 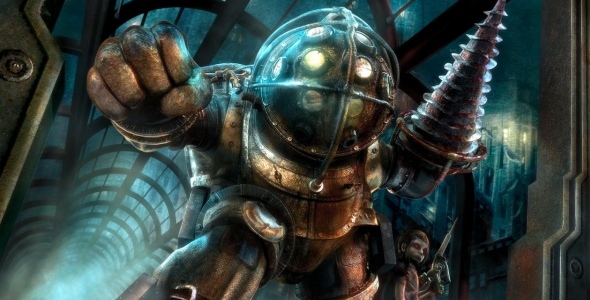 The technological advancements displayed in the Bioshock series are malevolent, while in Mass Effect it is what frees mankind to make the galaxy a better place. This moral dichotomy is not universally true, especially in some sub genres such as space opera, it is common enough that any piece of work which breaks the mold merits further examination. To this end, none of the technology in the game is shown as either good or evil. It is always presented as a tool, which humans use to their own ends, as morality is a human concept. This presents itself most clearly in the three high tech factions present in the Capital Wastelands. The Brotherhood of Steel is the first high-tech faction the player is likely to come across, especially in the main storyline of the game. Clad in power armour and wielding laser rifles, they are a sudden and extreme change from the rest of the Wasteland. Most people are wearing either old, dirty, pre-war clothing and armour, or patchwork gear made from scavenged junk worn by the raiders. Weapons are mostly knives and crowbars, with a 10mm pistol or a hunting rifle being a valuable find. Most of the world you see is put together by people using refuse you could find in a modern dump. The first encounter with these high-tech soldiers is a sudden reminder that the nuclear war that pushed humanity underground occurred a few hundred years in our future. This technological bend extends beyond their equipment. Upon entering their base, you find a large number of librarians, members of the order dedicated to technological research. They both attempt to recover old technology, and do independent research, on how to power a giant robot and build new weapons like the Tesla Cannon. They are creating knowledge and technology, a stark contrast to the world of scavengers around them. The Brotherhood are designed to exemplify the best of intentions. The language of their ranks brings to mind chivalric ideas, as they are squires and knights and paladins. The faction in the Capital Wasteland has broken from the main order in the west. After arriving in DC, the head of the order, Elder Lyons, was distressed by the state of the place. Instead of scavenging and repairing high technology, their original mission, they have taken it on themselves to help the people in DC. They wage war against the Super Mutants in downtown DC, and protect those who are unable to fight for themselves. There’s no indication of a reward on their behalf. They are just doing the right thing. There are lower tech members of the Wasteland Society that match them in goals and ideals. They often appear as the sheriffs and security forces in towns, and those that support them. 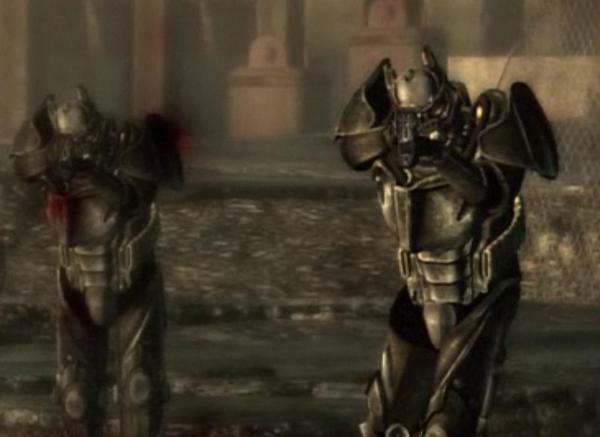 These characters are limited in what they can do, in part by the fact that they cannot walk through a hail of bullets, protected by power armour, or able to drop the more dangerous Wasteland dangers with the heavy energy weapons. The Outcasts were once members of the Brotherhood of Steel. The initial mission that brought the order to DC was to recover technology. The plasma weaponry and high-tech vehicles were always intended for the good of humanity, but the greater Brotherhood vision puts the needs of the many over the needs of the few. It is not their true design to protect all people, but to ensure humanity as a species survives. When Elder Lyons, the leader of the Brotherhood, decided to defend the downtrodden, the Outcasts left the DC branch of the Order. They continued to pursue their original purpose. They are looking for technology for its own sake. They are not overly concerned with the greater politics or even future of the Capital Wasteland. They are merely looking to find what they can and preserve it for posterity. While they do not go out and actively engage the evil in the Wasteland, they do not cause it either. On the rare occasions you encounter them, they will let you go about your way as long as you leave them be. They never engage threats head on, and they always seem to be trying to avoid trouble. If something attacks them, or if something attacks you, or a good or neutral NPC in their sight, they jump to action. Their energy weapons are brought to bear, and they end the threat as quickly as possible. Then they return to seeking out technology. They do not seek a reward, or even seem interested in talking to those they saved. They did it because they were there, and now that is over and they want to move on. They are most like the wastelanders and scavengers found throughout the Capital. They are willing to help if they have to, and the few quests that involve them show that they will work with you when mutually beneficial, but they never go out of their way to find a fight. As an offshoot of the Brotherhood, they are shown to have their own librarians, but these are less prominent as the player spends less time in their bases. They study and retrofit the tech they do find, but are more curators and rebuilders than innovators. Where the Brotherhood presents itself as a knightly order, the Enclave is a military, complete with uniformed officers. While the Brotherhood actively defends the player when met, and the Outcasts will assist if necessary, the Enclave attacks the player on sight at almost every opportunity. They enter the game most prominently when they stop the restoral of project purity, denying the Wasteland unlimited clean drinking water. They are equipped similarity to the Brotherhood. Their lookis sleeker, but they still wear powered armour and wield futuristic guns. They also have scientists, who are found both doing field research in the wastelands, and lab work in their pristene headquarters. The Enclave are trying to restore an America they believe once was. To that end, they want to control the waters from Project Purity, and pervert the intent from one of salvation to a method of cleansing the undesirable from the wasteland. They launch offensives, sometimes against non-military targets. They attack the player on sight, kidnap the player, and tempt the player kill every irradiated being in DC. They are aggressive, and visciously and remorselesly pursue their goals. They are an exageration of the raiders, taking what they want and destroying anything else. They are voilent, and are concerned with how their actions affect those around them. The main difference between the high-tech factions and the standard wastelanders comes down to capacity. None of the bands of raiders can shape the Wasteland in their image the way the Enclave might. None of the scavangers can gather or protect what the Outcasts can pull from the ruins. None of the lawmen in the towns can provide the scope or scale of protection the Brotherhood provides. 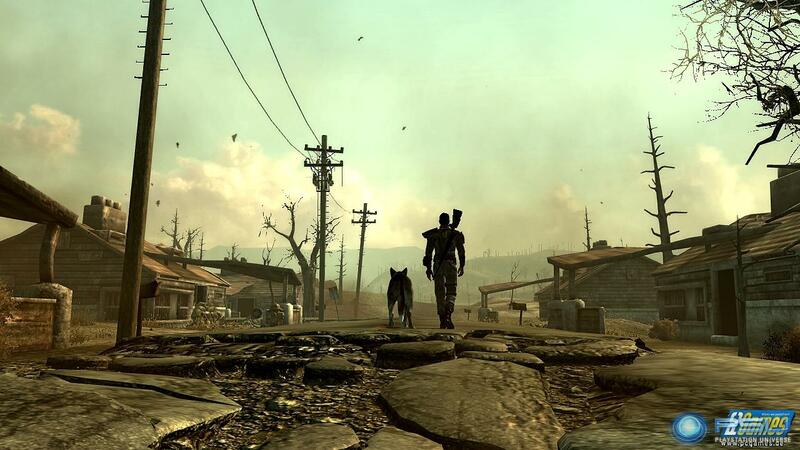 Technology doesn’t change who people are in Fallout 3, it just makes them more. Next time, we will take a look at how this is expressed in the artificial intelligences and robots of Fallout 3. So far, we’ve looked at the fathers of Mass Effect 2; how they are too demanding, how those who appear good really aren’t, how they screw up the lives of their children, and how metaphorical fathers are as bad as the real thing, if not worse. This time, we’ll look at what happens in the absence of a father. Jack was kidnapped by Cerebus when she was a child, and was raised for most of her life in a laboratory, away from the influence of her parents. She is presented with so much potential. She is considered the most powerful human biotic in existence. She is the most dangerous prisoner at the jail where you go to pick her up. She destroyed a Cerebus facility, nearly singlehandedly, as a child. She constantly asserts her freedom, able to go and do whatever she wants. In cut scene, where the story becomes more important than the game play, she is shown as incredibly competent, facing several opponents at once, and seeming to be on par with Samara, a highly respected warrior of a species that lives for a thousand years and is, on average, more powerful with biotics than the best humans. She appears to lack the limits of the other characters, but she also lacks direction. She doesn’t know what she wants or how to get it. She has all the power she needs to be whoever she wants, and do whatever she wants. Her ambition and vision rarely exceed her instant, animal state. With a lack of foresight, she is stuck entirely in the moment and what it can offer her. The other characters talk about what they might be doing if they weren’t assisting Shepard. Jack doesn’t seem to know or care. She is beligerant and vague when asked what she will do after the mission is over. For Jack, the future isn’t something she can prepare for. While it may not be the intent of the team making the game to attribute this potential, and its waste on Jack’s lack of parents, it is definetaly a striking coincidence. Especially when considering Shepard. Shepard is difficult to discuss thematically, because he isn’t just one character. He isn’t even necessarily male. For the sake of ease, we will assign this gender for him for the rest of this blog. As the player’s character, his gender, face, and background can be customized, and he is in fact a spectrum of characters, of a small variety of backgrounds, who will each be presented similar situations and be given a range of options between Renegade and Paragon. At character creation, the player can either select the default John Shepard, pictured above, or customize their options. Once the gender is selected, a history and a psych profile are chosen. Ignoring the gender option, this means there are nine possible Shepards at this stage. When selecting a background, you chose between Spacer, Colonist, and Earthborn. Of these options, only Spacer gives Shepard living parents, and he is a military brat. In Colonist, his parents were killed by slavers. in Earthborn, he never knew them. He was an orphan, raised on the streets. If you chose the default, Earthborn, the true orphan option is chosen for you. It takes effort on the players part to give Shepard parents. A customized background must be selected, and only a single choice provides living parents. The backgrounds don’t have a major effect on the game. They are mentioned sometimes in dialogue, and each has a single unique quest in Mass Effect 1. Most of Mass Effect 2 remains unchanged by this choice, as Shepard’s more recent history, from the first game, is far more important to play. As the default option is set to Earthborn, the majority of Shepards are likely orphans. As the player character, Shepards have more options. Other characters have a narrow bredth of responses to a situation, tempered by what Commander Shepard does. They can become more or less Paragon or Renegade, offering forgiveness or vengance, but they can only go so far down one path or another. The player makes Shepard’s choices. The range of his options is much broader. No Jacob can ever reach the Renegade depths of a dark Shepard, and no Garrus can ever become as upright in his thoughts and deads as the most upstanding Paragon Shepard. The player has the choice to make him a Paragon of virtue, or a Renegade who will worry about the ends more than the means. While this is an effect of Shepard being the protagonist in a video game, the likely lack of parents makes this more interesting. No one shaped the man he would become, and at every single instance, he has the choice to move to either the Paragon or Renegade extreme. 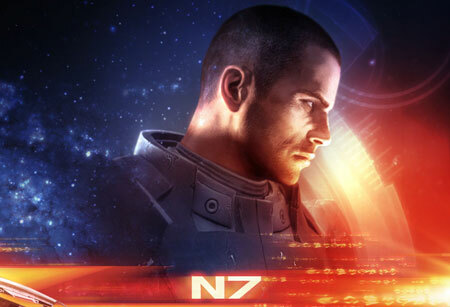 Unlike Jack, Shepard has the character’s guidance, and can either chose in the instant, or work towards the player’s vision of who he should be. Shepard also shares Jack’s potential. Shepard can save or damn the universe. 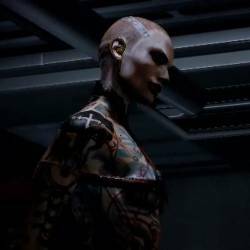 While there is the option to beat the game in a manner where Shepard dies, it is far more likely that at least he will survive the suicide mission. He makes huge choices that affect the entire galaxy. Before the game starts, he has decided whether to save the Council, or replace the interstellar government with a human Council. Throughout the game, he decides the fate of both the krogan and the geth races through is actions. In the end, he decides whether to grant Cerebus the incredible power of the collector base, or destroy it. The entire shape of the universe revolves around Shepard’s choices. In most cases, no one has ever limited his potential, and in most cases, no external parental force has provided guidance on how he should proceed. He is a great and powerful force, and in some ways, he is like a father figure to the entire universe. In effect, Shepard is the father of Council space. He decides the structure of authority by selecting the ruling body in the first game, the consequences of which are played out in Mass Effect 2. He decides who lives in the universe, possibly destroying the rachni in the first game, and chosing the fate of the krogans and the geth in the second. He decides what crimes merit forgiveness and which receive vengeance. He becomes the ultimate authority figure. He is reinstated as a Spectre, the special agents of the council. While he has Cerebus’s backing, they are unable to force him to act in any particular manner, but he decides where they will prosper and where their influence will be diminished. All the examples of bad parenting seems to be set as examples for Shepard. He is being shown what happens when he fails in his duties. He is shown in a microcosm how his actions will affect the galaxy. He needs to decide if the strong vision he has is worth the cost, if the future generations will understand what he wanted for them. He needs to understand the difference between his reputation and his actions, and understand that those who follow him may have strong reactions to the truth. He may be forgiven, or he may be vilified. He is shown that children are the responsiblity of his parents, and those actions that are a step removed, consequences of his consequences, are still his responsiblity. He can stop them before they happen, or he can hunt the undesirable to punish them when the problem has occurred. If he decides that something needs to leave, some group of beings no longer has a place in his universe, he will carry the weight, and be haunted by the decision. He will live with that choice, and it will be questioned by those who come after. He needs to know if he is willing to defend those calls. Shepard has the gift of determination. He needs to understand that while he can ignore the greater implications, the consequences are still going to occur. They will come back to him. As the father of his universe, he will be held accountable by his children, even if he refuses to answer for what he did.